Rachel Bilson was the celebrity guest at the grand opening of Target To-Go this morning, at Gansevoort and Washington Streets at the High Line entrance. Bilson was on site to help hand out gifts to The Salvation Army families and the public. Target placed approximately 500 oversized and easy-to-identify gift tags in Manhattan. Target will give each guest that returns a gift tag at Target To-Go a gift card, worth anywhere from $10 to $500, and in turn Target will donate $100 to The Salvation Army to benefit families in need. Clues to the gift tag locations were revealed on Twitter, @TargetToGoNY. 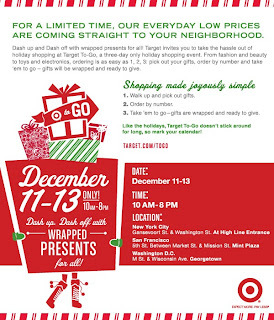 Target To-Go is a 3-day walk-up shopping space in NYC, San Francisco and Washington D.C. It's open to the public from Friday, December 11 through Sunday, December 13, from 10 a.m to 8 p.m. I couldn't make it to the grand opening, but I decided to brave the cold and checked it out tonight right before they closed. There are 50 wrapped and ready to-go gifts to choose from. The order sheet is attached to the clipboard, which shows a tiny image of all 50 items, making it very hard to see the details. The selection wasn't what I anticipated - dvds, memory cards, hair dryer, gingerbread house decorating kit. I was thinking there would have been more trendy and unique gift pieces that wouldn't easily be found online or at other stores. But I guess the more people are familiar with the items, the easier it is for them to shop quickly. There were a few good things on the list including a cashmere scarf and Rodarte dresses and belts, but I prefer being able to touch the fabric and see what you are buying up close.